LIVONIA, MI--(Marketwired - Jul 24, 2017) - Zeal Credit Union's Incredible Science Machine team, which shattered the Guinness World Record in 2016 for the largest domino circle field, is back again. This year, the team will attempt to break the national record for the most dominoes toppled in the United States. 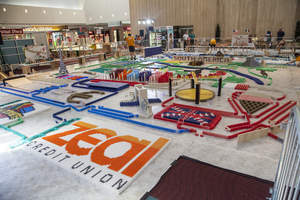 Using more than 250,000 dominoes, Zeal Credit Union's Incredible Science Machine: Game On! will include video games, board games and sports. "You won't want to miss this outstanding family event," said Tiffany Sweet, youth and community development coordinator for Zeal Credit Union. "The hard work, passion and dedication these builders put into their art is incredible. We're so proud to support them, because they are a great reflection of what our credit union represents." Head builder Steve Price, Canton native and graduate of Michigan State University College of Engineering, will once again lead an experienced team of domino artists and chain reaction machine builders from the U.S. and around the world including Canada, Austria, Germany and Switzerland. The public is invited to attend this record breaking event at 2 p.m. on Sunday, July 30, 2017, at the Trillium Academy, 15740 Racho Blvd. in Taylor. Event tickets are currently available at all 12 Zeal Credit Union branch locations throughout metro Detroit. The credit union is requesting a donation of five dollars per ticket to benefit students in the Detroit Area Pre-College Engineering Program (DAPCEP). The Incredible Science Machine team will also hold a meet and greet with demonstrations that are open to the public from 5 to 7 p.m. on Thursday, July 27, at the Southland Center, located at 23000 Eureka Road in Taylor. Sweet reported that videos of the Incredible Science Machine events in 2015 and 2016 have received a combined total of 13 million views on YouTube. Individual builders have received more than 50 million views on YouTube videos they have posted. "It takes more than 15 minutes for the Incredible Science Machine to topple, so until you witness the event, it's hard to imagine the thousands of dominoes and hundreds of other everyday items that go into this," added Sweet. For more details about the Incredible Science Machine and other ways you can get involved to demonstrate your passion, visit www.IncredibleScienceMachine.com. Zeal Credit Union is a full-service, non-profit financial institution with more than 61,000 members, assets exceeding $555 million and 12 full-service branch offices in metro Detroit. Members also have access to more than 5,000 shared branches and nearly 30,000 ATMs nationwide. Member deposits are insured to $250,000 by the National Credit Union Administration (NCUA), a U.S. government agency. For more information about Zeal Credit Union, visit the credit union website www.ZealCreditUnion.org or call 800-321-8570. A view of Zeal Credit Union’s 2016 Incredible Science Machine as builders make final adjustments in advance of the huge chain reaction event.